Barack Obama says Democratic senators should reject the man proposed by Illinois Governor Rod Blagojevich to replace Mr Obama in the US Senate. Mr Blagojevich is the subject of a criminal inquiry and has been charged with attempting to “sell” Mr Obama’s now-vacant seat to the highest bidder. The governor defied pressure and picked Roland Burris, the state’s former attorney general, to fill the position. Democratic senators have vowed to veto anyone appointed by Mr Blagojevich. The president-elect said he agreed the Senate “cannot accept” a new senator chosen by Mr Blagojevich, adding that Mr Blagojevich himself should resign. Mr Blagojevich denies wrongdoing and has rejected previous calls for his resignation. Mr. Obama, on vacation in Hawaii and who, aides said, was surprised by the news of the appointment, issued a statement condemning the move. Barack Obama insists he didn’t have any contact with Illinois Gov. Rod Blagojevich or anyone else who might have been scheming to sell the president-elect’s U.S. Senate seat. But he has not yet given his transition staff the same clean bill of health – perhaps with good reason. An examination of the FBI complaint against Blagojevich and the days immediately following Obama’s historic election victory suggests the governor was highly interested in Obama confidante Valerie Jarrett as a potential Senate appointee, albeit with a steep price tag. The 76-page complaint contains multiple references to “Senate Candidate 1,” whose description clearly fits Jarrett, a former finance chief for Obama’s earlier campaigns and incoming senior White House adviser. In secretly recorded conversations, the Democratic governor said he’d be willing to appoint Jarrett – Obama’s supposed favorite to replace him – in return for a high-paying job at a national union organization called Change to Win. Illinois Attorney General Lisa Madigan has filed a motion with the state Supreme Court about Gov. Rod Blagojevich’s “inability” to do his job, Madigan spokeswoman Robin Ziegler said Friday. Madigan will hold a news conference Friday about the matter, her office said. 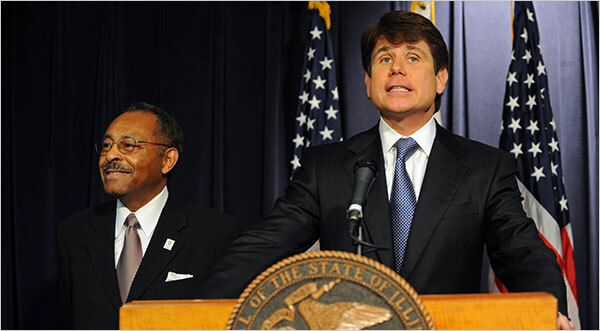 Madigan said Thursday that stepping down is the “right thing” for Blagojevich to do. She added, “If he fails to, the two other options are obviously the Legislature moving forward on impeachment, or I have the opportunity to actually go to our Illinois Supreme Court and ask them to declare basically that our governor is unable to serve,” she said. In that case, Lt. Gov. Pat Quinn would become acting governor, she said. Madigan had said she wouldn’t wait “terribly long” to take action. You are currently browsing the archives for the appointment category.